A Bird on Every Table: How Did Turkey Become the centerpiece of Thanksgiving? There are a lot of things that might vary from table to table when it comes to Thanksgiving dinner. Some people prefer sweet potatoes to mashed potatoes. Others forgo the ubiquitous pumpkin pie in favor of pecan or cherry. However, there’s almost always one constant – that beautiful, golden brown, perfectly roasted turkey as the centerpiece. This is the case in regards to 88% of all American tables. It only stands to reason that you’d have your questions as to “Why turkey?” – was turkey served at the first Thanksgiving? Even if it was, why is it so popular as to appear on nearly every menu no matter how much the other meal components might vary? Here we’ll explore everything you ever wanted to know about how turkey became the Thanksgiving superstar that it is. The First Thanksgiving by Jean Leon Gerome Ferris, early 20th century. Was Turkey Served at the First Thanksgiving? Most people simply assume that turkey is the staple that it is because it was served at the first Thanksgiving way back in 1621. However, while the Pilgrims and the Wampanoag Native Americans most certainly did share a bountiful table in order to resolve their differences and celebrate the harvest, it’s not a given that they did it with turkey drumsticks in their hands. That said, we know that the very first Thanksgiving table probably featured poultry of some kind. We also know that wild turkeys were plentiful in the area, so they’re certainly a possibility. However, so were a multitude of other options, including geese, ducks, and swans. Even eagles, hawks, or cranes are a distinct possibility. When and How Did Thanksgiving Dinner Become All About Turkey? If the Pilgrims and Wampanoag only maybe ate turkey at the first-ever Thanksgiving feast, then how on earth did it become the unofficial mascot of the holiday? Although no one knows absolutely, there is one really strong possibility as to why and how turkey became the star of the entire show. The whole situation dates back to an 18th century American writer named Sarah Josepha Hale. Hale was born in New Hampshire in 1788 and was a highly popular editor in her day. She is also the person responsible for penning “Mary Had a Little Lamb.” Most importantly of all, Hale was a major role model for women, so many popular choices of the time in regards to fashion, literature, decorating, and cooking could be traced right back to Hale’s writing and influence. "[It] is considered as an appropriate tribute of gratitude to God to set apart one day of Thanksgiving in each year; and autumn is the time when the overflowing garners of America call for this expression of joyful gratitude. As you can see, Hale’s ideal picture of a Thanksgiving feast included a turkey as the centerpiece. She continued to support that standard for Thanksgiving going forward as well. That said, when she eventually (posthumously) succeeded in having Thanksgiving established as a national holiday after 17 years of lobbying, it makes sense turkey would be a given. This idea would continue to be reinforced and strengthened over the years by popular culture, as well as traditions like Ronald Reagan’s symbolic turkey pardoning, so turkey does take center stage for historic reasons. However, it’s not for the reasons most people think. What Else Was Served at the First Thanksgiving? As touched on above, in all likelihood you serve and eat turkey every Thanksgiving for reasons that have nothing to do with what was on the Pilgrim’s first feast table. That leaves one question. What was served and enjoyed at the first Thanksgiving? The following are some likely probabilities. Venison: In addition to the possibility of turkeys, ducks, or geese, there were lots of other meats served. We know for a fact that one of them was venison, as Winslow’s account expressly stated that the Wampanoag arrived bearing five deer that were then roasted over a spit. Seasonal Produce: The first Thanksgiving was primarily a celebration of the Pilgrims’ first harvest, so there most definitely would have been a bounty of freshly harvested produce served. Local vegetables that were likely to have appeared include but are not limited to corn, peas, carrots, beans, onions, lettuce, spinach, and cabbage. Fruits included plums, cranberries, blueberries, grapes, and gooseberries. Seafood: Seafood was a huge dietary staple in New England in the 1600s as well, so historians believe that it probably comprised most of that first meal. Lobster, oysters, clams, and bass were probably all present. There may even have been a chowder or two served. As far as things that most likely weren’t eaten, potatoes and sweet potatoes top the list, as they weren’t popular enough food sources among the English or the colonial settlers at that time. There probably wasn’t any pumpkin pie, either, as the flour and butter necessary to make it wouldn’t have been available, nor had the settlers constructed the ovens necessary for baking. Like turkey, those staples would enter the scene and become wildly popular later on. So there you have it – the why and how of Thanksgiving dinner as you know it today! Probably not quite what you pictured, but historically significant all the same. Which foods will be gracing your table this year? On Thanksgiving, we look at the classic Thanksgiving painting. Thanksgiving started as a tradition many centuries ago. In fact, it began almost as far back as European colonization of the American Colonies began. The widely-recognized first Thanksgiving is 1621, where settlers at the Plymouth Plantation held a celebration after the crops were delivered successfully that year. It later became a formal holiday in the US Civil War year of 1863 after Abraham Lincoln wanted to give thanks to the Lord. 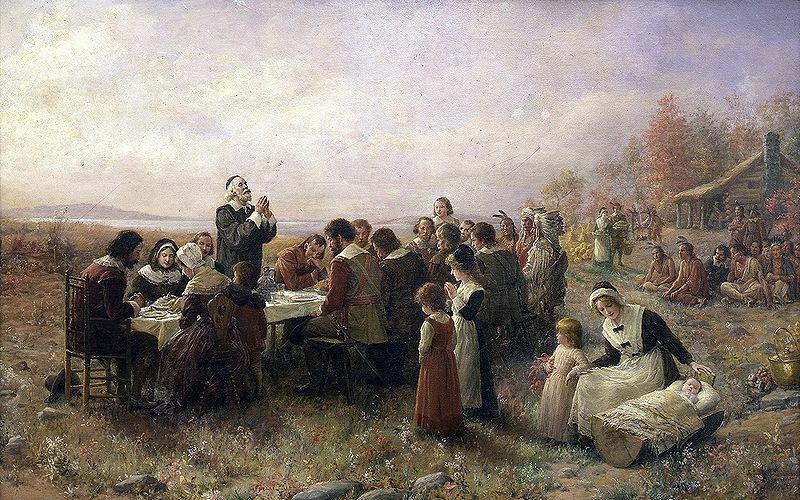 The image above, The First Thanksgiving at Plymouth, depicts that first celebration. It is a painting by Jennie Augusta Brownscombe from 1914, and was made famous after appearing in Life magazine. In the picture we see the recent settlers mixing with the local Native American tribes, while thanks is given to the Lord. We are also drawn to the small children to the left of the picture. We wish you a Happy Thanksgiving! To find out more about the site and to get your hands on some exclusive podcasts, why not join us? Click here.